Is My Dog Smart, Or What? This morning, my two year old Golden Retriever attacked the Wall Street Journal before I did. He left it, like so much confetti, sprinkled across the front lawn. Is my dog smart, or what? Reading the papers these days is akin to riding a roller coaster blindfolded. You never know what’s coming next. So I have taken to creating my own reality. I keep my nose to the grindstone, try my best to turn potential problems into opportunities, and work closely with top-notch staff, customers, sales reps, and vendors around the world. It also helps to have a fabulous array of products. Pacific Merchants prides itself itself on a range of housewares both broad and deep. 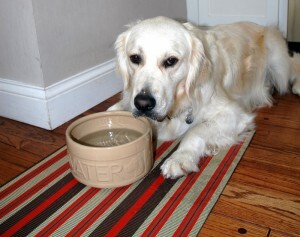 Our MacFab, Saleen and Malibu place mats run the gamut from restaurant elegance to outdoor practicality. Our Acaciaware™ serving pieces are exotic beauties hand-crafted with pride in the Phillipines. Sturdy stoneware bowls, bakeware and petware from iconic British manufacturer Mason Cash are heirlooms to pass from one generation to the next. Price & Kensington teapots and tea accessories are cheerful, functional additions to any kitchen. Our American-made Cutting Edge Flex Mats, decorated with stunning archival-quality photography, serve as both light-weight cutting surfaces and sophisticated placemats. And our stylish Multi-Use Eco Mats, perfect for kitchen, mudroom, doorway or pet area, are also produced stateside from 90% recycled materials! STYLE. FUNCTION. VALUE. Do you see a theme here? It’s my Pacific Merchants reality, and it beats the heck out of the morning papers. Posted in Pacific Merchants | Comments Off on Is My Dog Smart, Or What?